Local Hero Storytime at IB Library featured Aztecs Women's Basketball Team today! Local Hero Storytime at the Imperial Beach Branch Library featured Aztecs Women's Basketball Team today! 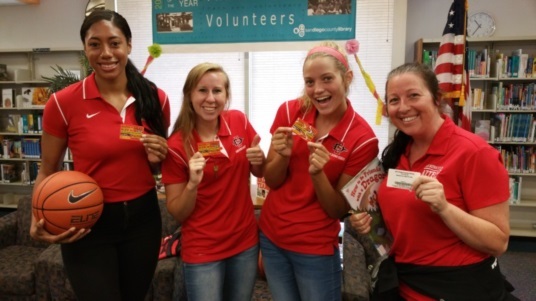 Some of the SDSU Women’s Basketball Team members hosted the Imperial Beach Library’s monthly Local Heroes Storytime. Players Deidra, Alli, Lexy, with Assistant Coach Gladie came and read books, taught the students how to dribble, and shared their experiences in school and on the court. The Children loved them!